Growing acorn squash is a nutritious and tasty vegetable to grow in your garden. This squash, named for its acorn-like shape, is available in several varieties, but most grow similar to other squash. Acorn squash is well worth investing in. This type of winter squash is not difficult to grow in most climates. It also keeps for long periods without spoiling after you pick it. For the best results, prepare the ideal environment for these vegetables. 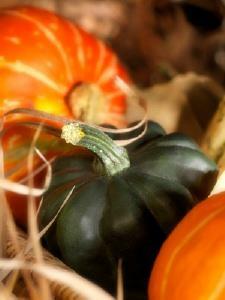 Space: Most acorn squash varieties grow on a large plant, which continues to spread out throughout the growing season. Give the squash enough room to grow, which may be as much as 50 square feet per hill. Each hill can contain two or three plants. This number of plants produces a dozen or more squash throughout the growing season. Soil: Planting the squash on a hill is ideal. If this is not an option, a mound of soil is the best route to take. Ensure the soil is rich in nutrients for a larger crop and larger sized squash. Good drainage is key to the success of these plants. Seeds: You can start acorn squash from seeds in most United States climates right in the garden. You can also purchase starter plants from your greenhouse or garden shop. Do not plant until the threat of frost has past. If growing from seed, place four to five seeds per hill of about 50 square feet apart for other hills. Mound loose dirt into a hill shape and push seeds several inches deep. Initial Care: Once you plant the seeds or plants, carefully monitor them throughout the growing season. Keep weeds at bay as weeds will strip important nutrients from the soil. Keep soil within the mound loose but be careful not to dig up any roots. Keep soil damp, but avoid overwatering. Good drainage keeps roots from sitting in soil that is too damp, which can lead to rotting. Growing Season: Once the seeds sprout and the vines begin to emerge, little care is necessary for these plants to do well. However, be careful about using pest control on these plants. Bees are necessary to keep the flower blossoms pollinated. Once pollinated, the acorn squash begins to grow. Many insecticides kill bees, which will stop the plants from producing. If you need to use insecticides in your garden, apply away from the flowers. Apply only in the late part of the day, after the bees have visited the flowers. Harvesting: Acorn squash can take up to 90 days to fully mature. Some varieties offer much shorter growth periods. You can harvest the squash at any time, though, once it turns a mostly solid green color and the rind is hard. If planting in May or early June, you should be able to harvest beginning in September through October. Be sure to harvest all squash prior to the first hard frost of the season. To harvest, simply use a sharp knife to cut the squash from the vine. Leave about two inches of stem on the squash. Storing: Once harvested, keep the squash in a good, dry location. Maintain a temperature of 50 to 55 degrees F to store the squash for an extended amount of time. When growing acorn squash, pests can be a problem especially at the start of the season. Apply an insecticide on the vines and near the base of the plant if you notice cucumber beetles. As mentioned, do not spray insecticides on flowers and only do so late into the evening. Squash bugs are another type of pest that attacks vines. If the soil remains too damp, the squash will have a difficult time maturing. The rind may not become hard and insects may easily infest the plant. To avoid this, build up a mound of loose dirt as much as a foot high and a foot wide to plant the seeds or young plants in.